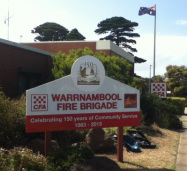 In 2013 it will be the 150th Anniversary of the formation of Warrnambool’s Fire Brigade. The Brigade is collecting information from its history. If you have anything to contribute, please call into the station, or contact us on 03 5562 3206. To let people know they its our birthday we have put a new sign up on the corner of the fire station. Thanks to Daniel and the team at Logos Ahead we've got a great looking sign to highlight the upcoming celebrations.